Ian Baird’s Spitfires will take on rivals Salisbury City in the Blue Square Bet South tomorrow night (7.45 pm kick off) at the The Raymond McEnhill Stadium with great confidence after a 0-4 convincing away win to Hampton & Richmond Borough on Saturday. Baird made some changes to the side that fought back to draw 2-2 away at Staines. Graeme Montgomery replaced Scott Rogers (who was out with flu) in midfield and left back Michael Green made way for Gary Elphick to make his first start since he signed from Eastbourne Borough. 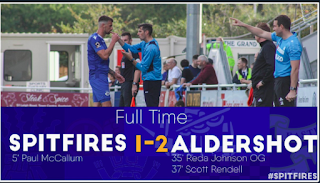 These changes pushed Andy Forbes to left back so captain Tom Jordan could partner Elphick, and the new defensive partnership were successful as The Spitfires defended well throughout the game giving on loan Southampton goalkeeper Jack Dovey a relatively easy game. It took just five minutes for the deadlock to be broken. Daryl McMahon, who filled in for the absent Rogers in central midfield, and Damian Scannell combined together on the left wing allowing the former West Ham United midfielder to cross a ball into the area where Jamie Slabber flicked a header just inside the post to score his tenth goal of the season in all competitions. The first half saw very few chances after the goal. On 15 minutes the home side had a corner taken by Ryan Blake and his cross was met by the head of Beavers captain Dean Inman but his effort on goal came back off the post. Graeme Montgomery’s shot was then saved by former Eastleigh reserve keeper Craig Ross. The half time whistle was approaching when asssitant referee Rob Smith signalled to referee Chris Powell that he had a groin injury. There was a break in play whilst a qualified linesman was found from the crowd. Eastleigh doubled their advantage twenty minutes after the break. Jamie Slabber released Damian Scannell who did well to run down the right wing to play a ball across the face of goal. Bradley Bubb made no mistake with a close range finish being in the right place at the right time to score his seventh goal in six appearances on his loan spell at the club from Aldershot Town. Andy Forbes has scored the most goals in Eastleigh’s history with 145 goals and striker turned defender collected the ball in the left back position after 72 minutes and ran down the wing to the edge of the box before placing a shot past goalkeeper Craig Ross. After second half substitute Jamie Brown picked up a harsh tenth yellow card of the season, the utility man was fouled just outside the box with minutes to go and creator of the opening goal Daryl McMahon curled a free kick past The Beavers keeper to put the icing on the cake for The Spitfires. While The Spitfires were cruising to their fifth match unbeaten, 13th placed Salisbury City were in a tough battle against relegation threatened Bromley at The Raymond McEnhill Stadium where The Whites lost their first league game in six league outings. After Salisbury had the better of the first halves, Bromley’s Anthony Thomas gave the visitors the lead just five minutes after the restart. Winger Albert Jarrett made a run down the left wing, beating two players before putting a great cross into the box, which was parried away by Smith into the path of Joseph-Dubois. The midfielder saw his shot hit the crossbar and fall to Thomas, who made no mistake by shooting home to give the visitors the lead. Just four minutes later, Bromley doubled their advantage. Jarrett beat his man down the line and whipped a cross into the box which Hakeem Araba left for Thomas. Thomas back heeled the ball to Joseph-Dubois who finished at the second attempt after his first shot was blocked by Salisbury keeper Tommy Smith. Eastleigh’s last game against Salisbury was at home at The Silverlake Stadium which proved to be a close encounter after The Whites made The Spitfires battle for a share of the points. 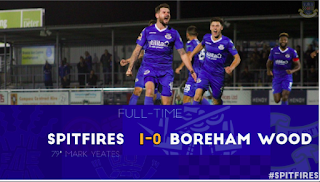 It took seventeen minutes before former Spitfire Robbie Matthews put the visitors in front. Eastleigh’s Andy Forbes missed an interception which led to Matthews finishing from a long ball. After a disallowed Salisbury goal in the second half and much pressure from the visitors, former Aldershot Town winger Graeme Montgomery came on as a substitute in the 80th minute. Montgomery popped up with a dramatic late equaliser with a superb 30-yard strike that curled in to the bottom right corner six minutes after he came on, much to the delight of the Eastleigh management team and players. 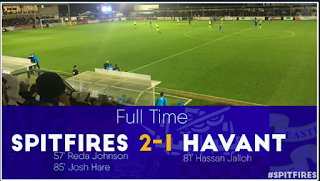 There was still time for a late winner however both teams just couldn’t get past the opposition goalkeepers who played a key part in the game including Eastleigh’s Jack Dovey who made a fantastic double save in the dying minutes to ensure the match finished as a 1-1 draw. Coming into to this game Salisbury have secured the signings of three new players. Former Portsmouth defender Ugo Udoji on a non-contract basis, Mark Scott on loan from Swindon Town who previously played on loan at the club this season and Charlie Griffin on loan from Forest Green Rovers who has also played for the club two seasons ago scoring 21 goals for The Whites. Salisbury v Eastleigh has "little chance"